Normal arterial blood pH is restricted to a very narrow range of 7.35 to 7.45. A person who has a blood pH below 7.35 is considered to be in acidosis (actually, “physiological acidosis,” because blood is not truly acidic until its pH drops below 7), and a continuous blood pH below 7.0 can be fatal. Acidosis has several symptoms, including headache and confusion, and the individual can become lethargic and easily fatigued. A person who has a blood pH above 7.45 is considered to be in alkalosis, and a pH above 7.8 is fatal. Some symptoms of alkalosis include cognitive impairment (which can progress to unconsciousness), tingling or numbness in the extremities, muscle twitching and spasm, and nausea and vomiting. Both acidosis and alkalosis can be caused by either metabolic or respiratory disorders. Figure 1. 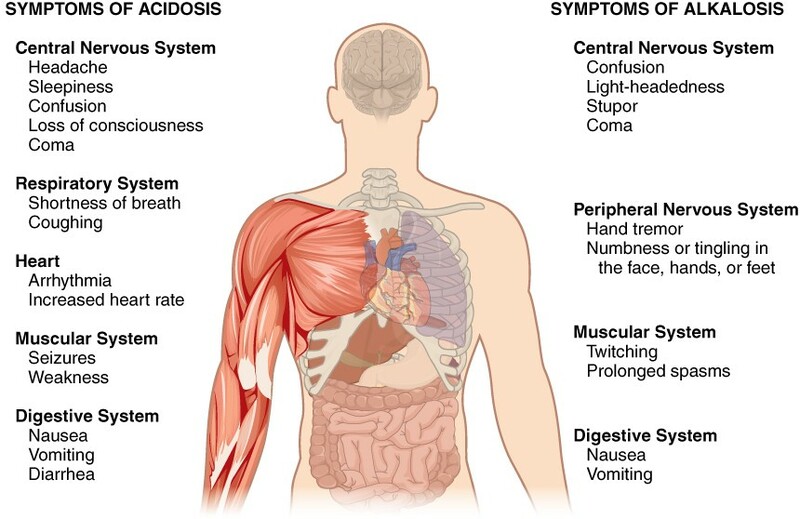 Symptoms of acidosis affect several organ systems. Both acidosis and alkalosis can be diagnosed using a blood test. Metabolic acidosis occurs when the blood is too acidic (pH below 7.35) due to too little bicarbonate, a condition called primary bicarbonate deficiency. At the normal pH of 7.40, the ratio of bicarbonate to carbonic acid buffer is 20:1. If a person’s blood pH drops below 7.35, then he or she is in metabolic acidosis. The most common cause of metabolic acidosis is the presence of organic acids or excessive ketones in the blood. Table 1 lists some other causes of metabolic acidosis. Because oxygen is reduced, the respiratory rate increases to accommodate, and hyperventilation removes CO2 faster than normal, resulting in alkalosis. Lab tests for pH, CO2 partial pressure (pCO2),and HCO3– can identify acidosis and alkalosis, indicating whether the imbalance is respiratory or metabolic, and the extent to which compensatory mechanisms are working. The blood pH value, as shown in Table 2, indicates whether the blood is in acidosis, the normal range, or alkalosis. The pCO2 and total HCO3– values aid in determining whether the condition is metabolic or respiratory, and whether the patient has been able to compensate for the problem. Table 2 lists the conditions and laboratory results that can be used to classify these conditions. Metabolic acid-base imbalances typically result from kidney disease, and the respiratory system usually responds to compensate. Acidosis and alkalosis describe conditions in which a person’s blood is, respectively, too acidic (pH below 7.35) and too alkaline (pH above 7.45). Each of these conditions can be caused either by metabolic problems related to bicarbonate levels or by respiratory problems related to carbonic acid and CO2 levels. Several compensatory mechanisms allow the body to maintain a normal pH. Case Study: Bob is a 64-year-old male admitted to the emergency room for asthma. His laboratory results are as follows: pH 7.31, pCO2 higher than normal, and total HCO3– also higher than normal. Classify his acid-base balance as acidosis or alkalosis, and as metabolic or respiratory. Is there evidence of compensation? Propose the mechanism by which asthma contributed to the lab results seen. Case Study: Kim is a 38-year-old women admitted to the hospital for bulimia. Her laboratory results are as follows: pH 7.48, pCO2 in the normal range, and total HCO3– higher than normal. Classify her acid-base balance as acidosis or alkalosis, and as metabolic or respiratory. Is there evidence of compensation? Propose the mechanism by which bulimia contributed to the lab results seen. Respiratory acidosis is present as evidenced by the decreased pH and increased pCO2, with some compensation as shown by the increased total HCO3–. His asthma has compromised his respiratory functions, and excess CO2 is being retained in his blood. Metabolic alkalosis is present as evidenced by the increased pH and increased HCO3–, without compensation as seen in the normal pCO2. The bulimia has caused excessive loss of hydrochloric acid from the stomach and a loss of hydrogen ions from the body, resulting in an excess of bicarbonate ions in the blood.